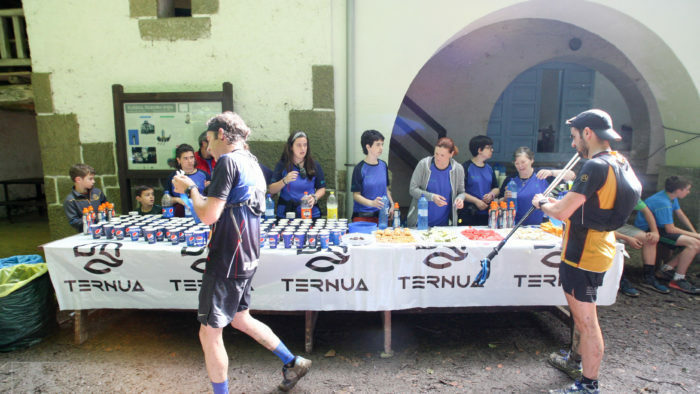 This was the third year that we travelled out to Ehunmilak, the Basque Hundred Miles race, but it was far from ‘business as usual’ this year. Unsettled weather in the days leading up to the race meant that the forecast for race weekend was a bit uncertain. Unfortunately dangerous conditions led to both Ehunmilak and G2H having to be stopped mid-race, though runners took the news well and prizes were still awarded for the shortened races. So it was eyes to the sky for the final race of the weekend – the Marimurumendi Marathon. Would it be a case of ‘third time lucky?’. After another big storm the night before the race the forecast looked mercifully clear. 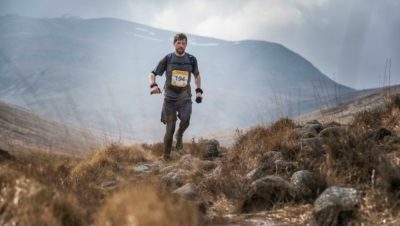 And although the race takes in a fair amount of ascent for a marathon – 2,300m – it avoids some of the bigger peaks of the region, so runners would be safe if bad weather did hit. The runners set off with clouds above, though it was incredibly humid. 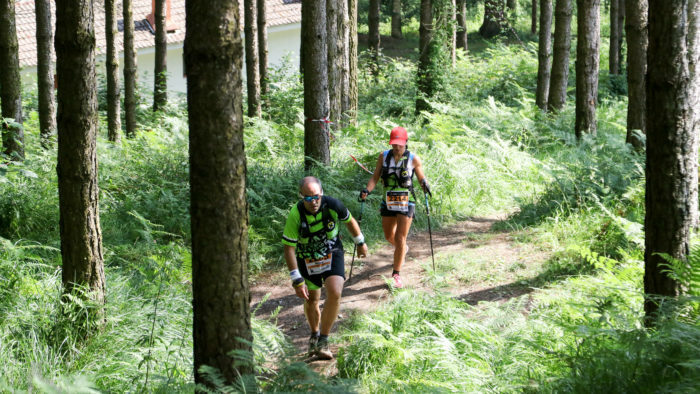 The race is run mainly on good forest paths and it isn’t as technical as Ehunmilak or G2H. However, it was very, very muddy from the days of rain preceding! While there aren’t many big climbs it is constantly hilly, with lots of short sharp ones. It climbs for 7km right from the start up to the top of Murumendi, which gives the race its name. The ‘Mari’ prefix refers to a goddess in Basque mythology, who lives in the caves in the area. It’s said that she is the personification of nature and sends rain, hail and storms according to her will. She certainly had a busy weekend. After Murumendi the route is constantly rolling until you get to Atxurtza and begin the very steep climb up to Izazpi, the highest point on the marathon, at around halfway. The second half is slightly more forgiving, though the last climb up to Agorta is a bit of a sting in the tail. The route is really nice, with a mix of lovely tracks through forests, open paths along hillsides, stunning views and local villages. But what makes this marathon particularly special is the locals! I was stunned by the amount of support, even on the summits. All the way along the route people – and often whole families – were out supporting, offering you water, helping you along. I know very few Basque words but I used ‘eskerrik asko’ (thank you) all day long and my face hurt from smiling at people. I took far too long at aid stations because the volunteers were so friendly and wanted to see how you were doing. When they realised you weren’t from the Basque Country they were even more hospitable, with many testing out their best english on you. This is a marathon where you will be thoroughly looked after. 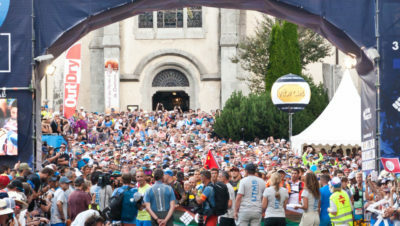 After 26 miles of beautiful countryside and incredible support, fuelled by fruit, pastries and chocolate, you drop back down into Beasain, high five hundreds of children lining the last kilometre and are greeted at the finish as if you had won the race! More food, more drink and a great technical finishers’ t-shirt (part of the entry fee, along with the metal water bottle and number belt you were given at registration) and then it was back to the hotel. I had a shower and watched the last few runners come past my hotel to the finish, then I heard the first claps of thunder. Mari had kindly waited until after the cut-off to resume the storms. That’s the kind of hospitality you get in the Basque Country. Find out more about all the Ehunmilak races here.